The Commission on Elections Office of the Overseas Voting (COMELEC OFOV) joins The Filipino Channel (TFC) and the Department of Foreign Affairs Overseas Voting Secretariat (DFA OVS) to strengthen the call for overseas Filipinos (OFs) to participate in the 2016 elections. COMELEC OFOV, the implementing arm of the overseas voting Act, DFA OVS, the deputized agency overseas and TFC, the premier network in the world, formally entered into a tripartite agreement today, October 7 at the ABS-CBN Corporation headquarters in Quezon City, Philippines. The tripartite agreement hopes to bring more awareness on the importance of the overseas vote; inspire OFs to take the first step to vote; and then translate these registered OFs to voters who can then play a role in nation-building by choosing the country’s next leaders. The TFC team was also represented by ABS-CBN Global Head of Content Ned Legaspi and Regional Finance Officer for Asia Pacific Lawrence Reyes. TFC and DFA OVS initially signed an agreement on August 26 in the hope of increasing the numbers of registered voters worldwide. Since then, the TFC team on its part has explored all its platforms to propagate the overseas vote. The PSA is also seen via TFC’s seafarer service with partner shipping lines plying 150 nations. Through TFC’s community boards airing worldwide and social networking sites, the network has also been sharing important updates on the overseas registration as well as reminders for the upcoming October 31 deadline of registration. TFC has also been opening its events for the Philippine posts to tap for off-site registration. During the historic “ASAP 20 Live in London” nearly a hundred Filipinos registered during the one-day concert in September 6 where Filipinos from London and nearby cities trooped to The SSE Wembley Arena to join their kababayans celebrate the “Galing ng Filipino.” On September 20, about a hundred Filipinos who were at the Rosehill Gardens in Racecourse to join Kapamilya stars at OKGo! Australia, availed of the consular services including for registration at the booth of the Philippine Consulate in Sydney. In Japan, the Philippine Embassy registered over 300 registered voters in the two-day “Philippine Festival” conducted by the Philippine Festival Organizing Committee and the Philippine Embassy. On October 11, the Philippine Embassy (PE) in Korea will also conduct an on-site registration at the “Bayanihan Sa Korea” at the Ansan Wa Stadium Plaza in Ansan City where TFC is media partner while TFC will let the PE conduct an on-site registration at the TFC@theMovies screening at the Nexus Auditorium, 5 Koek Road Singapore 228796 on October 18. 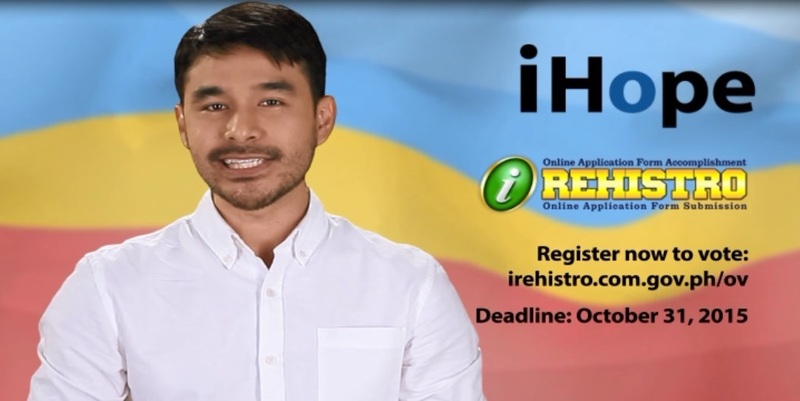 Filipinos in these areas are encouraged to register online at irehistro.comelec.gov.ph, print the form, bring their ID and have their biometrics taken at these mobile registration centers. Meantime, OFs in the Philippines can also register at 13 overseas registration centers (OVRC) in the Philippines. These are: DFA Regional Consular Office in Davao, San Fernando, Pampanga, Cebu, and DFA Satellite Offices in Robinsons Galleria, SM Manila & Ali Mall; DFA Office of Consular Affairs in ASEAN Business Park in Paranaque; NAIA Terminals 1 to 3 in Pasay City, POEA in Ortigas, Mandaluyong, & Philippine Transmarine Carriers Inc. in Makati City, Marina & Kalaw City, Manila; and CFO in Osmeña in Manila, & OWWA Training Center in Intramuros where ABS-CBN Middle East, Europe & Africa (EMEA) News Bureau Chief Danny Buenafe & Head of News Gathering Dindo Amparo registered themselves at launch. Deadline for overseas voting registration is on October 31, 2015 while the voting period for the 2016 Presidential Elections is from April to May 9, 2015. For more information visit www.dfa-oavs.gov.ph and www. comelec.gov.ph Watch out for more updates via TFC’s community board Global Post (What’s Up in the Middle East), Balitang Global and facebook pages worldwide.